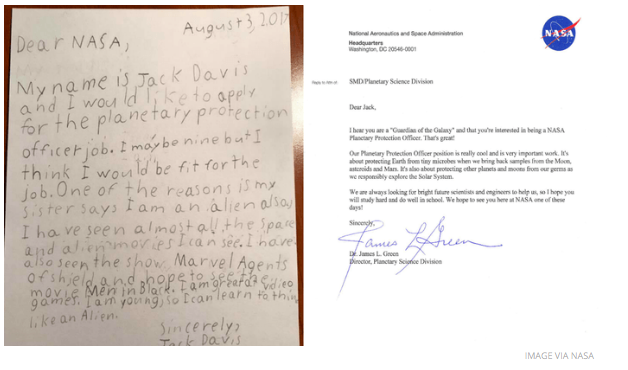 A viral story of a 9 year old boy who wrote to NASA asking to be hired as the Planetary Protection Officer (saving us all from aliens) has been making the rounds online as a feel good story about a spunky kid and the lovely letter he got back from NASA encouraging his dreams. But I think it goes further than that. In an age where kids are maligned as being always in their phones, never using their imagination, and not applying themselves, the story of young Jack Davis, Guardian of the Galaxy is an important one. One of dreams of the cosmos, and a staunch belief in oneself and what Jack believes to be his destiny. Jack has used pretty solid reasoning in that his sister thinks he's an alien already, so thinking like one wouldn't be a problem, and he's done the research in watching "Agents of SHIELD" and plans on watching "Men In Black" which is, of course, about aliens. There's no arguing with a 9 year old's logic, that's for sure. And it's Jack's confidence in himself that has to be commended more than anything. Interested in saving the universe? Why not write to the head honchos directly? He's young, that's a plus, and he loves learning, so why is he stuck in the 4th grade when he could be fulfilling his destiny before his 10th birthday? This is not the writing of a kid who has been lost to technology and television, this is a kid with dreams, with big dreams, and he's going to be someone special. That's why Jack's letter is so important, not just to him, but to all of our kids. If Jack can dream of space, so can anyone, and even if our sons and daughters don't dream of space, that shouldn't dissuade them from going after their own destinies. NASA didn't disappoint in their response, either. They wrote back to Jack, thanking him for his enthusiasm in the space program, filling him in on what the job he was applying for would entail, and treating him as the mature young man he is. Of course, they also snuck in the fact that he isn't qualified for the job YET, so he should definitely stay in school and study hard so he can really apply for that job monitoring the cosmos when he's a bit older. They didn't throw out the letter, or laugh at this kid and his silly dreams. They took Jack's letter to heart, and spoke to him as an equal. This is the kind of encouragement that is so important for kids to get from adults in general, that dreams can come true, and that outer space truly is within our reach if we just work hard enough and most importantly, believe that we really are guardians of the galaxy.